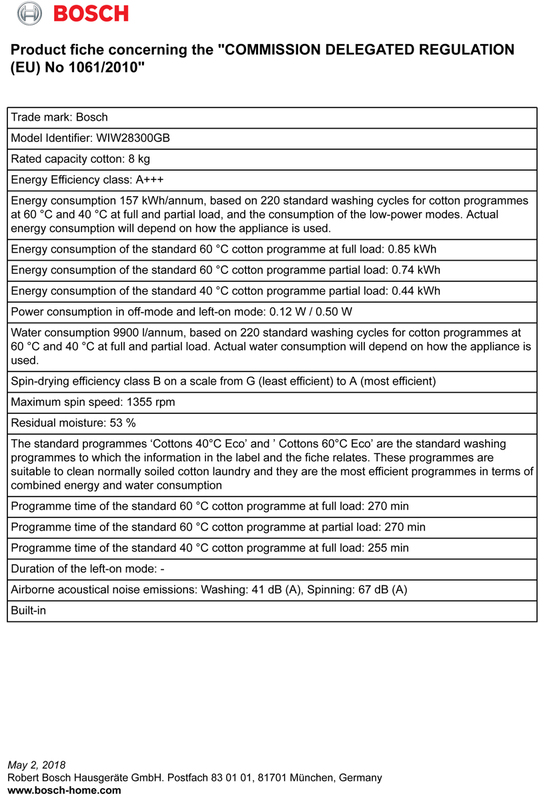 The Bosch Serie 6 WIW28300GB Fully Integrated Automatic Washing Machine feature well thought out and considerate design choices that gives you not only high cleaning performance but also exceptional energy and water efficiency. Thanks to the AntiVibration side walls your washing machine is much more stability than other machines while also reducing the vibration produced during the wash. Combined with the EcoSilence Drive you can be sure of a suitably quiet wash cycle that also saves you money thanks to the extremely energy-efficient design. Enjoy the best possible results for your delicate to your heavy items thank to the WaveDrum and VarioPerfect Programs. The WaveDrums interior structure, water and detergent are gently agitated to produce a cushioning effect to your wash with its unique drum structure. Whatever your laundry needs are the VarioPerfect system helps you save time, energy and money with the freely selectable program options to suit your wash load. The ActiveWater Plus system uses a sensor-controlled, automatic load adjusting and optimised water induction to make the most of each and every wash.
Time your laundry around your life thank you the 24h Start Delay option that put the end time of your wash in in your control.